As a mental health professional, I believe this accounts for much of the skyrocketing number of people living with anxiety, depression and a whole lot of other mental health challenges. While the focus of parenting in the early days may be to help your child survive, I believe just as much emphasis in the following years should be put into helping your child thrive. When it comes to helping your child thrive out in the world, the question of how to raise an emotionally intelligent child becomes central. Understanding our emotions and the emotions of others is the building block of every social and emotional skill needed to have healthy and fulfilling relationships and careers, which is echoed in recent research on the powerful impacts of EQ (Emotional intelligence). Ever since psychologist Daniel Goleman has brought the concept of emotional intelligence into the forefront in 1995 there have been decades of research indicating what a huge determinate emotional intelligence is on a person’s relationships and overall quality of life. Emotional Intelligence is defined as the ability to recognize, understand and manage our own emotions, as well as understanding the emotions of others. 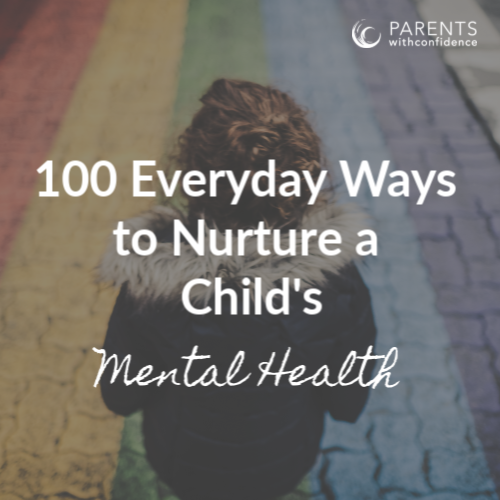 For a child this means having an awareness of what emotions are occurring within themselves as well as being able to identify and work through these emotions in both a personal and relational context. If all of the ’emotion’ lingo is starting to sound kinda fluffy, hang tight. 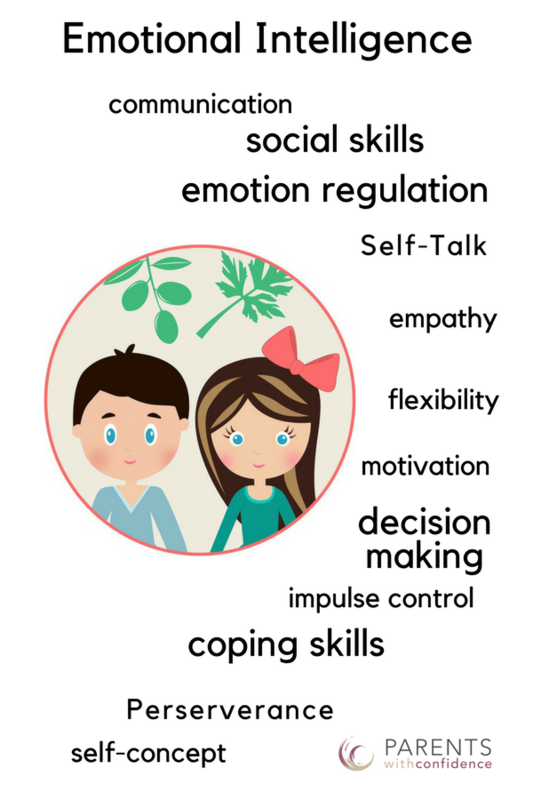 Let’s talk about why emotional intelligence has such a pervasive impact on your child’s relationship with themselves and those around them. Knowing how to identify and navigate through our emotions is the primary building block of every social and emotional skill. What does this mean? It means that when we have awareness of what emotions are occurring within us, that they are all acceptable and healthy, and how to cope with them, we have a framework for interacting positively with ourselves and others. Your child’s emotional intelligence is the platform for a host of critical daily skills, impacting almost everything your child does and says each day. 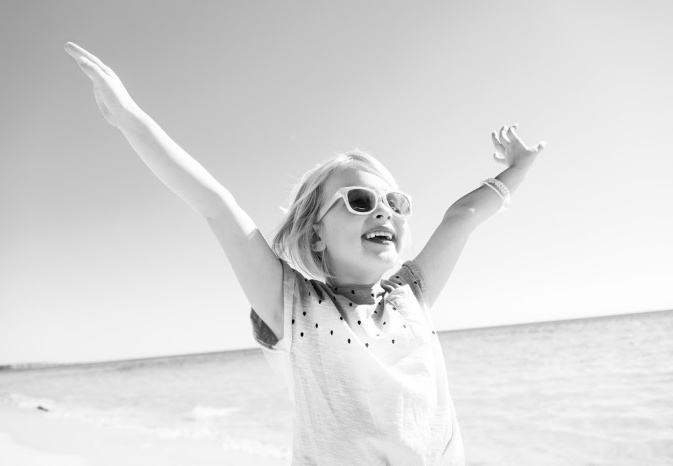 Here’s why exploring how to raise an emotionally healthy child is WELL worth it. 1. Increasing positive self-talk leading to a strong sense of self. 2. Increasing self-awareness which helps with regulating behaviors and emotions. 3. Assisting with self-awareness in peer interactions promoting healthy peer relationships. 3. Providing healthy coping strategies for big emotions and challenging situations. 4. Fostering ability for empathy in social and family environments. 6. Bolstering positive communication skills. 7. Nurturing good self-care skills. 8. Boosting motivation and perseverance in personal goals. 9. Enhancing conflict resolution skills. Pretty powerful stuff right? 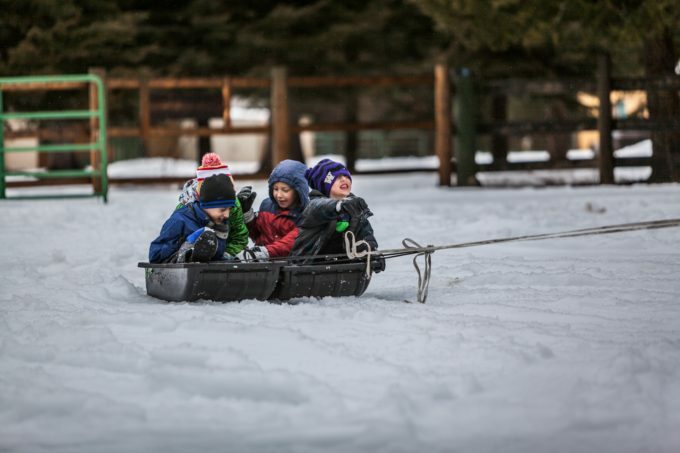 We know with great certainty that fostering the qualities that raise emotionally intelligent kids will greatly increase their success in both social and emotional endeavors, as well as contribute positively to their long-term well-being. The good news is, if you’re late to the ‘EI’ party it is a quality that can be modeled and taught to your child with some simple everyday behaviors modeled and taught by parents. As a parent, you have the opportunity to model and encourage the qualities of emotional intelligence in your child’s everyday life. Here are 7 ways to start today. 1. Change the story around emotion. It is hard to see your child struggle but their mental health and future relationships depend upon it. 2. Allow your child to express all emotions, to feel is to be human. 3. 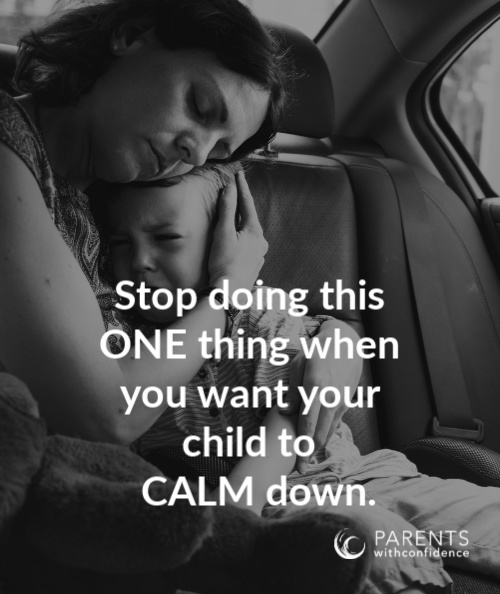 Provide your child with a calm steady presence throughout big emotions, which normalizes the expression of emotion. 4. Teach emotion words to your child consistently, emotions need to be identified before they can be worked through. 5. Identify your own feelings out loud, this helps model healthy habits for your child’s expression of emotion. 6. Model empathy for others, reflecting and considering the feelings of others is a skill that will greatly enhance your child’s relationships. 7. Practice different coping strategies together, what works will change with age, circumstance, and environment. While we all have unique hopes, dreams, and goals for our families, most of us would agree that without our mental health and meaningful relationships with those we love all the other stuff tends to fade into the background. I’m not going to lose any sleep over my 8-year-old forgetting a homework assignment or not getting top-notch grades. I’m also ok if she isn’t in club soccer, the captain of her volleyball team or reading at the highest level (of course these things can be wonderful for a child). 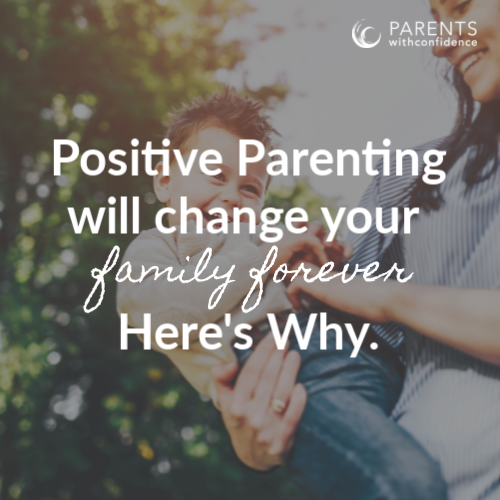 As parents, we can aspire to make an impact in the ways that count in the long run. We can encourage our children to live fully and authentically in their own humanity, engaging in healthy, fulfilling and meaningful relationships along the way. When we take the time to teach and model emotional intelligence with our child, we’re providing the tools for healthy life-long relationships with themselves, schoolmates, friends, future co-workers, and future spouses (just to name a few). When we sow seeds of emotional intelligence in our child we give them the gift of emotional health, allowing them to grow and bloom in every aspect of life. Not sure how to start supporting your child’s Emotional Intelligence? 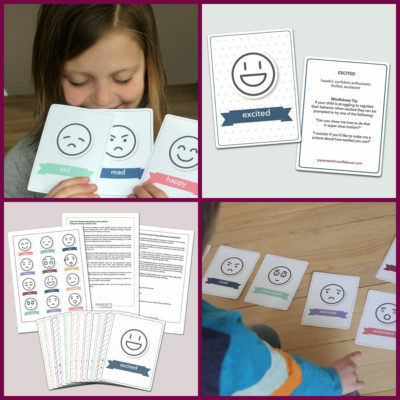 This emotional intelligence flashcard bundle is a great place to start! thanks for linking to Imagination Soup. The more I know, the more I realize I must be an emotionally healthy role model and make sure I’m doing what I want them to do!